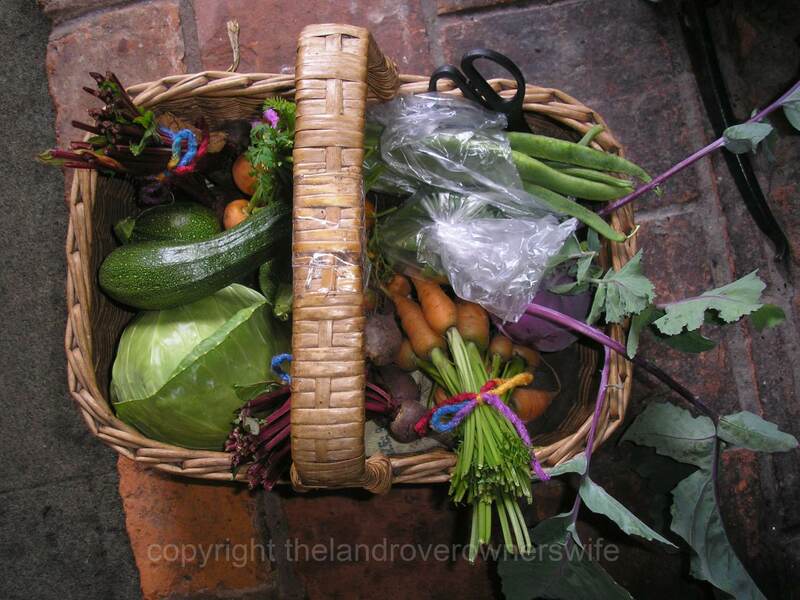 Cabbage and Kohl Rabi are just two of the veg picked this time. There comes a point every summer when the BBQ begins to lose its’ appeal and I long to be able to cook on my temperamental Rayburn once again and I have reached this point today. I can’t say for certain what it is about today that has brought about this need for a more conventional method of cooking because I’m usually okay until September time and Muds’ tolerance of salad and ‘Summer’ food is usually surpassed long before my need to be back onto making stews and home made bread. I suspect that it probably has a lot to do with what seems to be a trapped nerve in my left shoulder which makes carrying hot, heavy pans from the BBQ back into the house, less than fun. …… on the carefully painted cappings which line the load bed sides. Of course Mud is oblivious to my discomfort, despite my having told him that I had a problem and what it was, and is no doubt baffled my my seeming reluctance to help him with these tasks. He is a firm believer in the age old maxim that Series Land Rover Owners always help other Series Land Rover Owners regardless of any ailments, disabilities, injuries and pressing family matters and, as Annie is mine, that apparently applies to me to. I do sometimes wonder if this was one of the reasons behind buying Annie, after all a wife helping out occasionally is one thing but it would be very handy to have another Land Rover Owner in the house …… so that some ancient and mythical ‘Land Rover Code’ could be invoked as and when required. 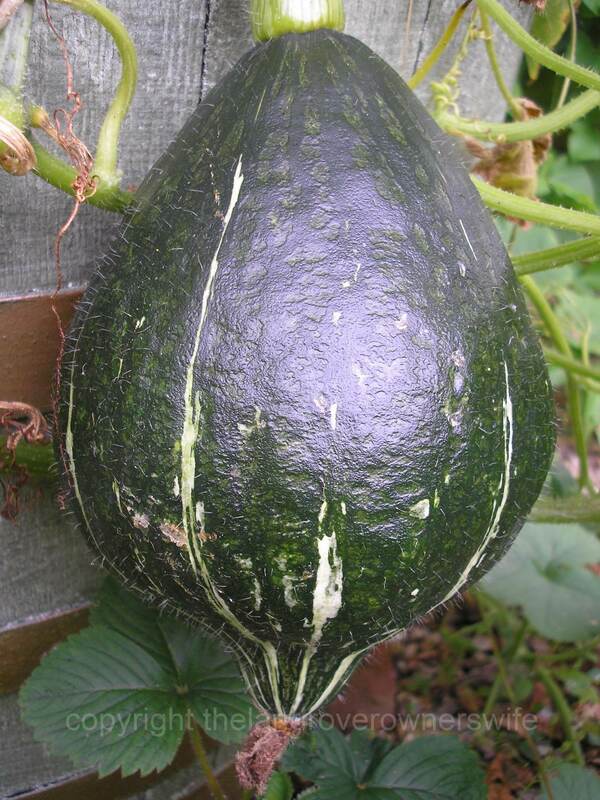 Another Hubbard Squash and this one is the size of a large Honeydew melon! Taking several deep breaths, I escaped from the workshop before Mud remembered a photo he meant to take, or that he had forgotten to tighten some bolt or other before repositioning the truck cab. Meandering down to the sanctuary of my garden, I surveyed the plot. It struck me how much the look of a garden can change in just a few weeks. Where the once lush green foliage of the potato plants had seemed to cover whole sections of the garden, there are now gaps appearing as the foliage dies back, leaving dull yellow and brown in place of the wall of green. The Cherokee Trail of Tears pyramid in one of the half barrels is about spent now and there are only a few fat pods left on the plant. These will hopefully provide next years seed and that seed should be more suited to our conditions. This is the whole point of self saving seed – each successive generation of seed saved adapting to the specific weather conditions, temperature and soil in which the parent plant grew. At least that is the theory. In the greenhouses, several more tomatoes are starting to change colour and the Wautoma Cucumbers are incredibly fat but very tasty. These are a good pickling cucumber, apparently but I seriously doubt we will have enough left to even try pickling, as cucumber is a favourite Mudlet snack. I do need to look into how best to retrieve the seed form these though, as this is another of the Real Seed Catalogue varieties that I really want to save seed from for next year. 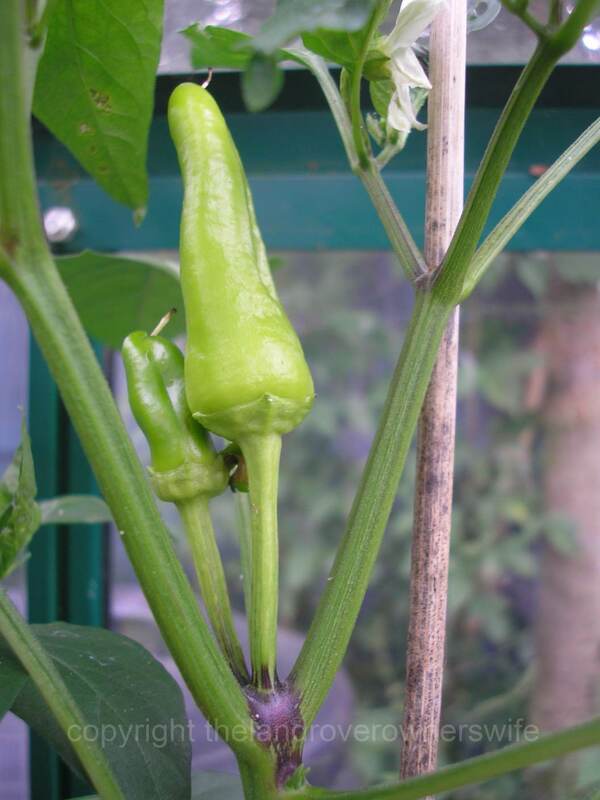 The large greenhouse is home to my chilli crop this year and we now have loads of the small but incredibly hot ‘Patio’ chillis forming, with a good number of Cayennes as well. I also have two plants from a ‘Caribbean Mix’ seed packet and, as such, I have no idea what they are! 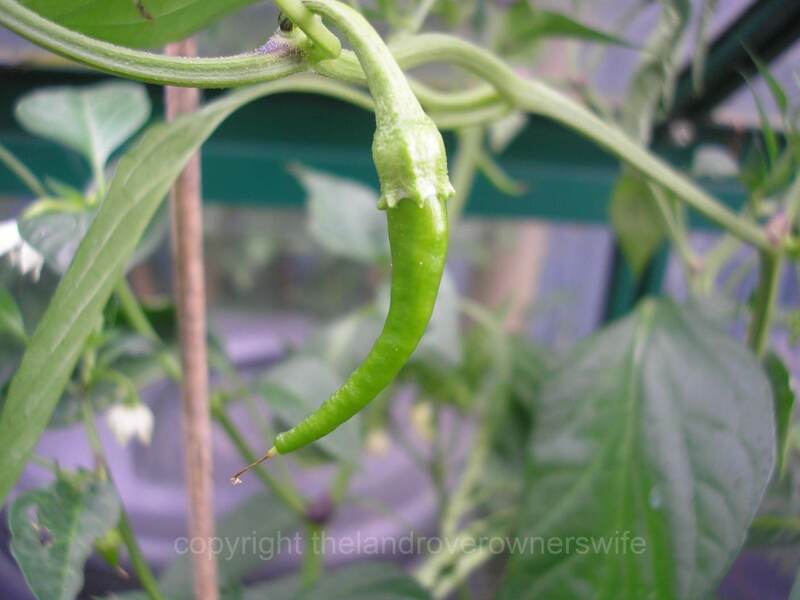 One plant is producing fat upwardly mobile chillis which are about 1.5 inches long and the other has very thin chillis which have only really just started to grow, the longest being about 1 inch long at the moment. No idea at all what kind of chilli this is ….. I love mixed seeds because you never know what is going to come from them and it adds a bit of interest whilst you wait to see what the finished article looks like. I can’t wait to see what colour these two varieties end up. There is also life in the propagator into which I sowed some cabbage and cauliflower seeds a few days ago. These are intended for the Winter gardens both here and at school. It will be a good exercise in seeing how these Brassicas do through the Winter compared to the incredibly successful Summer crop that is now coming to fruition. Feeling revitalised and calmer, I headed back indoors to oversee the tidying of the bedrooms. Middle Mudlet has a larger bedroom than Little Mudlet and manages to cover just about every square inch of floor, including under her bed, and work top with toys and books, despite repeated suggestions from Mud and I that if she tidied her toys away when she had finished with them then her room would stay reasonably tidy all the time, making life easier for herself. Little Mudelts room is smaller but she also never remembers to put her toys away. Anyway, today Middle Mudlet came up with the idea that she and her sister should tidy each others rooms up, obviously thinking that as Little Mudlet has the smaller room, it wouldn’t take as long! Little Mudlet, knowing just what state her room was in and just how many of her toys and books were under the bed, crammed into the teddy bear basket and various toy drawers, readily agreed to the swap and promptly managed to tidy Middle Mudlets room up in an hour or so. Middle Mudlet still hadn’t finished Little Mudelts room 2hours after starting and so will need to complete the job tomorrow – a deal is a deal after all. Mind you Little Mudlet hasn’t quite finished her sisters room and so she will need to do a little more work before I can get in with the hoover and duster. One thing is for certain though – Middle Mudlet will be tidying her own room up from now on in! Categories: .... on family life, .... on growing your own | Tags: chillis, Food, gardening, grow your own, Squash, vegetable gardening, vegetables | Permalink. I am so envious of your fruitful garden. It’s starting to look a little weary now in places but I’ll give everything a good feed today and a thorough dead/dying leaf trimming over the next few days, to give the plants a boost. This autumn I’ll be on the scrounge for well rotted manure to really feed the beds in preparation for next season. Hi Elaine. Oh your poor shoulder. Try your best to take it easy. I have mixed feelings about mixed packets of seeds, because I want to try them all and you can’t guarantee, which will grow from the seeds you planted and what if you never get to try one of them because they never seem to be the seed that gets sown. Maybe I’m a bit of a control freak! I am with you on the kids rooms too. It’s either shout or turn a blind eye – neither of these techniques actually work! Thankfully the shoulder seems much better today and I feel a little more energetic. I know what you mean about not getting all the varieties to grow from a mixed packet – I just like that little bit of uncertainty. Hope your shoulder is on the mend… Good excuse not to be assistant mechanic for a few days!